My favorite season is finally here!!! No, not fall or PSL season. I'm talking about football season. I love football, and can do a pretty decent job of following the game too, if I do say so myself. After spending my junior high and high school years cheering on the sidelines every Thursday or Friday, the start of September always means the start of football and all the great things that come with it. 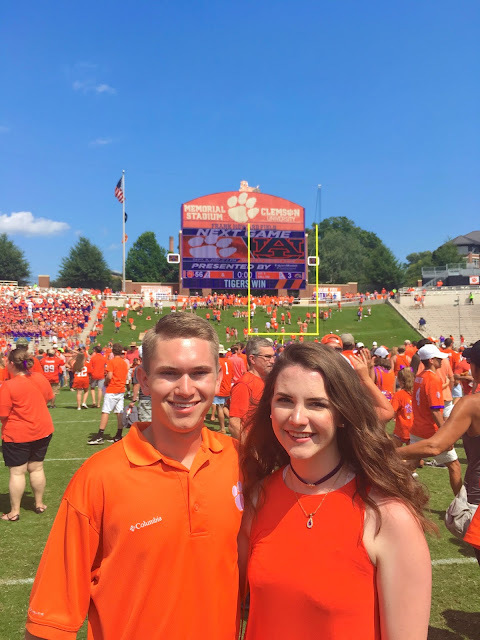 My first football game at Clemson was my first time watching a game for a school I attend as a fan. 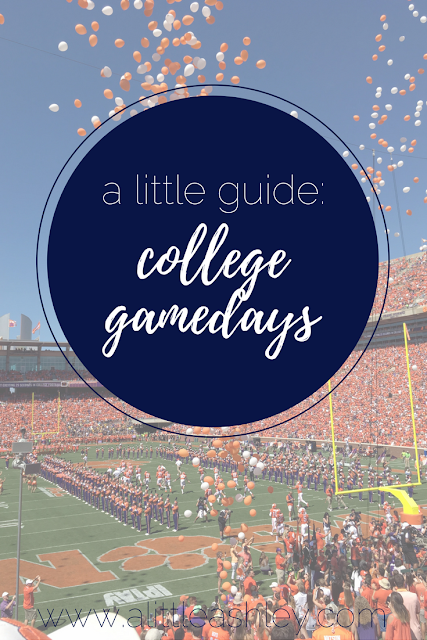 I wasn't sure how I felt about it, considering all the fun and excitement that comes from being on the sidelines, but I quickly learned how great gamedays are as a student. However, gamedays do come with a new set of situations that you have to be prepared for, so today I'm giving you a full guide on everything you need to know about surviving college gamedays. Can you even tailgate if you don't have the perfect tailgate outfit? Not in my world. However, game day is not the time to bring out your favorite pieces. The perfect Lilly sundress that just happens to be in your school's colors? Leave it on the rack or in your closet. Brand new white converse? Save them for walking around campus. Any expensive jewelry? Just don't. Game days are long and hot, especially at the start of the season. You'll most likely be hopping from one tailgate to another. Wear something cool and comfortable that you don't mind getting carbonated beverages spilled on, because it will happen - even if you're not the person who spills it. I'm a sundress and old cowboy boots type of girl when it comes to tailgate attire. This Old Navy dress (sold out in orange) that I wore last week was perfect for a hot first gameday. Some girls are the jersey, shorts, and sneakers type. Or others are really into being trendy and roll up in school themed cut up t shirts or crop tops. Honestly it's all about whatever you're comfortable in. You will be wearing this all day so don't choose something that'll be uncomfortable before 2pm. You think you can just roll out of bed, throw on your aforementioned perfect outfit and see where the wind takes you? Oh my dear friend, no. Game day takes planning. The day before you should work out with your friends where everyone is sitting at the game and where they are going to tailgate and what they plan to do after the game. Gamedays are so much more fun when you spend them with friends, so you don't want to wake up on gameday and realize all of your friends have plans already and you don't know where to go before the game starts. Failing to plan means planning to fail, just sayin. I'm a big fan of getting up early-ish on game days (I mean come on GET UP IT'S GAMEDAY!!!!). You don't need to be up at 6am by any means, but it helps to get an earlier start to the day. If you sleep in, you'll have to rush to get ready, won't have time for breakfast and it'll just be a rough day. So give yourself plenty of time, have your coffee and a filling breakfast, then start getting ready for the day. It's important to remember that game days are an all day affair, prepare accordingly. The eyeliner that smudges down your face two hours in, ditch it. A complicated party pony with a million bobbie pins sticking in your head, no thank you. Go for makeup and hairstyles that will stay all day. Your instas from the stadium at 8pm will thank me. Also, the MOST important tip: WEAR SUNSCREEN!!!! Put it on before you leave whether it's a noon game or you're starting tailgating at 2pm. Take it from someone who made the rookie mistake of not wearing sunscreen to a noon game last week, wear it. Be prepared, bring some extra with you if you can. These days, every stadium has some kind of clear bag policy in effect. There are a few options you can take to deal with this situation. a. Ditch bringing a bag altogether. Wear an outfit with pockets (this is essential if you're going with out a bag), get a sticky wallet for your phone to put your student ID, cards and cash in, and put any other essentials in your pockets. You will be limited on what you can bring with you to the game, but it's okay. Just don't be the girl asking everyone to hold her stuff for her. b. Find a cute, but tiny purse that is compliant with the "no bigger than the size of your hand" policy. I have a tiny orange crossbody that I manage to fit everything I need for game day in. c. Go with a bigger, but clear bag policy compliant bag to hold everything for your game day needs. If you choose b or c, I recommend making sure to have sunglasses, an external phone charger, lipstick/lipgloss, your IDs, cards, cash, a hair tie (!!!!) and any other necessity items. If you went with a bigger clear bag, you can also bring sunscreen to reapply and any spirit items you may want - like a pom pom or towel, like Texas A&Ms 12th Man towels. Now we get to the best part of gameday, in my opinion, Tailgating. Now, not every school is intense about tailgates as Clemson, which is unfortunate. But here in the South, we love a good tailgate and for good reason. Spending the day leading up to the game with good friends and good food just makes it that much more fun. There are two types of tailgates you will encounter: the family tailgates and the fraternity tailgates. Go to both types to get the full game day experience - this goes back to point #2 of planning ahead. Family tailgates are essential because that is where you will most likely get fed. *Free* food is really nice. No one wants to spend $20 at the stadium for a hotdog, so find a family tailgate to hang out at - yours or a friend's - and be fed. It's also really nice to talk to people who aren't college students sometimes and you may meet some cool alums. Last week at my big's parents' tailgate, we met a bunch of Clemson Theta alums! It was so much fun to hear their stories of our chapter 30 years ago. But make sure you leave time for fraternity tailgates. The frat tailgate scene isn't everyone's thing, I highly recommend checking them out at some point in your college career. There will be a lot of people and a lot of cheap beer (if you're 21), but there's a camaraderie to it. You're surrounded by tons of people who are excited about life and football and your school. It's an energy like no other. And a great way to meet people since you already have an easy conversation starter. Obviously, the most important part of gameday is the game. Do not be one of those people who doesn't make it to the game. 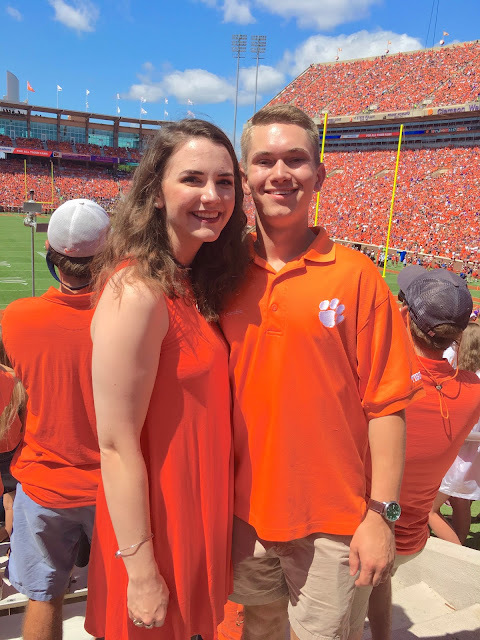 At schools like Clemson, not every student gets a ticket so it's really not cool if someone who has a ticket doesn't use it when there are literally thousands of people who would love to be there. Go to the game. And when you're at the game, be engaged with it, even if you don't know anything about football. Chances are someone around you would be willing to explain what's going on if you ask. Football games are the best way to experience the spirit of the school and they're so much more fun when you get really into it. Take part in the traditions, yell with the crowd, makes friends with the people around you. It's all part of the experience. Also, stay at the game. At Clemson there tends to be a mass exodus at halftime, especially if we're winning by a lot, which happens a good bit *insert hair flip. * But this goes back to the thousands of people who wanted a ticket. You're lucky enough to have one, support your team the whole way through. The tailgates will still be there when the game is over. Finally, make sure to tailgate and celebrate responsibly! So I think that is absolutely everything I have to say about game day, for now. What are your ingredients for the perfect game day?